ATS Acoustic panels provide the simple yet important function of absorbing sound. You can think of them like acoustical black holes - sound goes in and doesn't come back out. This panel is 24x48x2 inches. Cover fabric is an attractively textured, 100% jute. Wall-mounting hardware and instructions are included. All acoustic panels are rated with an NRC (Noise Reduction Coefficient) between 0 and 1. This rating indicates how much of the sound the strikes the panel is absorbed. 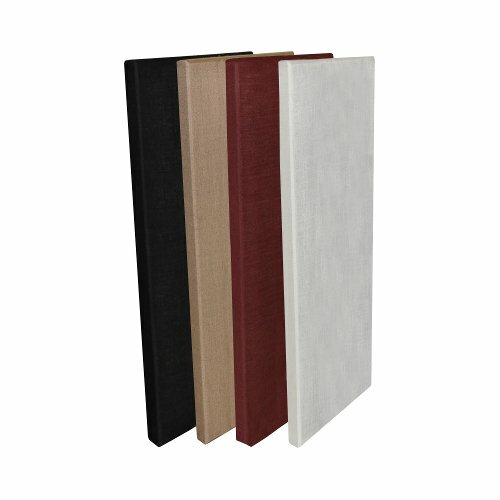 ATS Acoustic Panels in 2-inch thickness are rated 1.0 out of 1. Superior sound absorption means fewer panels are required to effectively treat your space. In a recording studio or mixing room, ATS Acoustic Panels reduce reflections from the room's hard surfaces. This keeps the sound clear, and free from excessive reverb. This is especially important when recording speech or vocals. Acoustic panels in your home theater ensure you and your audience will fully experience the great sound your system is capable of. Many houses of worship and other auditoriums across the country have solved their sound problems on a very reasonable budget by installing ATS Acoustic Panels. Provides clearer, more enjoyable sound by effectively controlling unwanted reverb and echo. Superior sound absorption: NRC 1.0 out of 1. Attractive, textured fabric complements studios, auditoriums, and living spaces. If you have any questions about this product by ATS Acoustics, contact us by completing and submitting the form below. If you are looking for a specif part number, please include it with your message.